2xCD ca 1995 Polygram 422 828 661-2 Includes a 2nd CD of Blue Monday-95 with catalog number "FREE CD 1"
2xCD de 1995 London Records 90 Ltd 828661.2 Includes a 2nd CD of Blue Monday-95 with catalog number "FREE CD 1"
2xCD uk 1995 London Records 90 Ltd 828661.2 Includes a 2nd CD of Blue Monday-95 with catalog number "FREE CD 1"
2xCS uk 1995 London Records 90 Ltd 828661.4 Includes a 2nd cassette of Blue Monday-95 with catalog number "FREE MC 1"
1-02 New Order Touched by the Hand of God Stannard and Rowe Mix ?:?? Q: Didn't Utah Saints and The Advent remix some tracks for The Rest Of? A: Utah Saints were supposed to remix a track for The Rest Of but they never did a remix due to legal problems. The Advent did a remix of Everything's Gone Green but the remix never made it to the album. The Advent released the remix as their own single with three additional tracks. 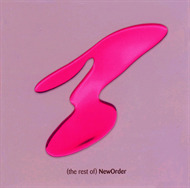 Q: It the original version of Blue Monday shorter than on the original 12"? Q: Ok, picture the CD sitting normally in front of you then turn it 90 degrees to the right so the part that opens faces you. Look at the other end through the clear bit if your copy HAS a clear bit, and you should see..and this is what i'm asking about... RW 2:1 1995 written there... does anyone know what this means, or is it a mystery like everything else New Order? A: A lot of people believes the the cryptic message denotes the date Stephen and Gillian got married. Some copies have the text "19.6.93 [heart symbol] 17.7.94".